Russian Systema traces its origins to various Cossack systems of the 10th century, including Gruntovsky, Buza, and Skobar styles. These styles were typically defined by the absence of rote memorization and fixed techniques. Later when the Soviet government commissioned the development of a research center for human maximization, the synthesized research in the Asian arts—along with a consolidation of the most pertinent attributes of their indigenous Russian martial arts—created various systems of combat designed to meet the demands of the modern soldier. These combat systems included sport sambo, combat sambo, and Samoz, which later evolved into Systema (or the "system"). 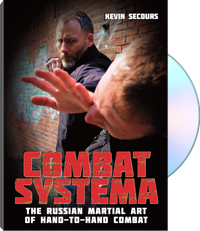 The Combat Systema approach outlined in this video series was created by Kevin Secours, after years of high-level study under top Russian masters. It is defined by a scientific approach to biomechanics, breath training, and combat psychology. The continuous use of pressure testing to measure and refine those attributes, combined with continued research in human performance, has helped shaped the most complete solution possible for the needs of the modern practitioner. Secours' first video with Paladin Press, Combat Systema: The Russian Martial Art of Hand-to-Hand Combat focuses on empty-hand combat techniques. From upper body and lower body strikes to stance infiltration, power generation, escapes from holds, and power absorption, this video offers a comprehensive, integrated understanding of the ground-breaking Russian training methodologies, specifically adapted for Western students and practitioners. For information purposes only.